Welcome to Chilli Heat! 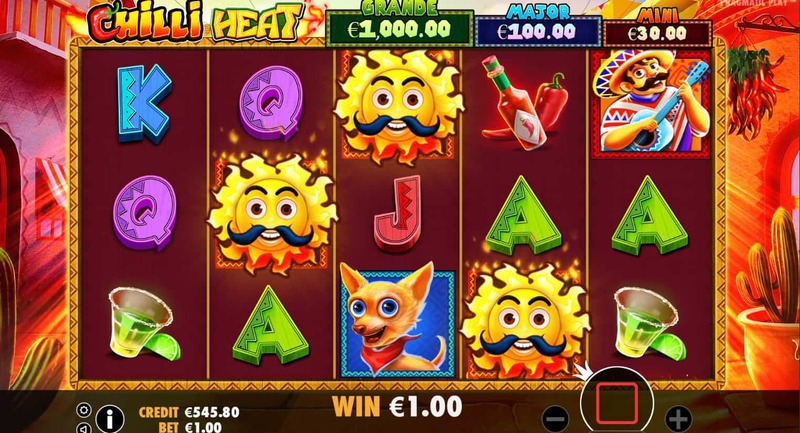 The blazing slot from the award-winning slot game provider Pragmatic games. This five-reel, three-row, 25-line Jackpot video-slot is a medium volatile slot with an RTP of 94.99%. Features include special symbols like the Money symbol, wilds and scatter symbols. The design and theme in Chilli heat are all about the Mexican summer. Be it the hot sun, chillies, a Mexican guitar player, hot sauce, or tequila. It is not the prettiest game we have seen, and the lower paying symbols 9-A look slightly out of place compared to the rest. In addition to the traditional symbols like wilds and scatters, we will find a third special symbol pragmatic call the Money Symbol, which looks like a bag of cash, and always comes with a written prize on top of it. This symbol actually represents the progressive jackpot within Chilli Heat. The wild symbol is a classic wild, and substitutes all other symbols, except the Scatter symbol. The special features in Chilli Heat do keep you busy as there is quite a lot going on. Here you should find free spins and a progressive jackpot. During the free-spins, all lower paying symbols are removed, which leaves only the higher paying and special symbols to bring you a bit closer to the money during your free-spins. The Scatter symbol in Chilli Heat is a blazing sun and arrives on reels 2,3,4 in the main game. If you get all three, you will receive eight free-spins plus triple your wager as a prize. Jackpots! 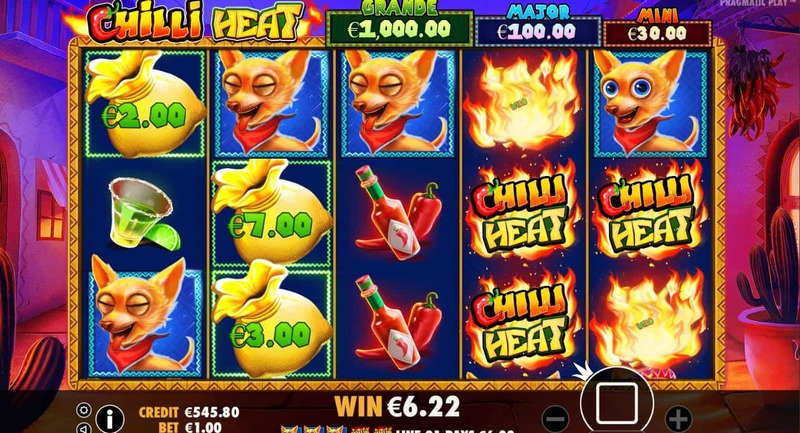 The Money Symbol in Chilli Heat will grant cash prizes, as well as trigger the Money Symbol Re-spins. The cash prize is random or can be the MINI or MAJOR jackpot. If six or more symbols land on the reels during the main game, the Money Symbol Re-spin feature will be activated. The Money Respin feature replaces all symbols with money symbols and empty symbol spots, and it is now your goal to collect as many as possible. You start with three re-spins, and any Money symbol you get will get stuck until the end of the re-spins. 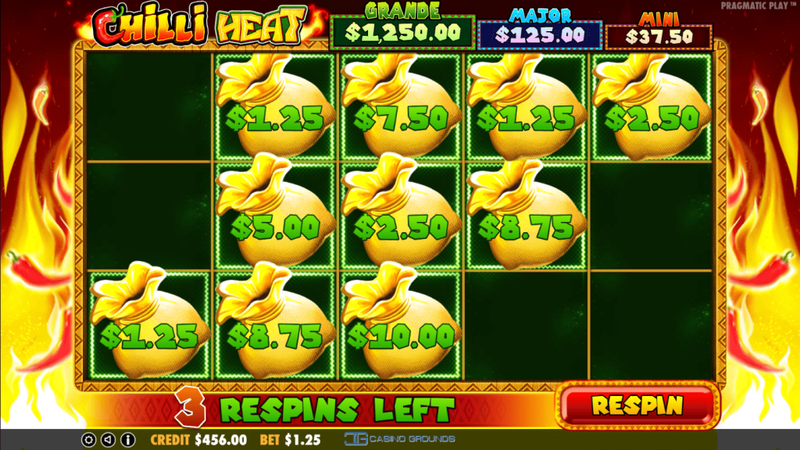 If you are lucky and fill all empty spots with a money symbol, you will receive not only all the cash as displayed on the reels but also the MAJOR Jackpot. The first impression of this slot was somewhere in the middle of the tree. At first glance, the design is not on top of the food-chain, and there is seemingly little special about their features. That said, after playing around with the slot for about 30 minutes, getting to know it a bit more, and aiming for those jackpots, we have to say the slot kept us well entertained for the full period we were playing. – The theme and symbols are not our cup of tea, but with a different demographic, and the fact that these jackpots are seemingly easy to get to, will keep loads of our fellow slot enthusiasts entertained.